Blank products are sold at End Quantity Pricing. Standard production time for blank goods is one business day. However, during certain times of the year orders may take 24-48 hours to ship. 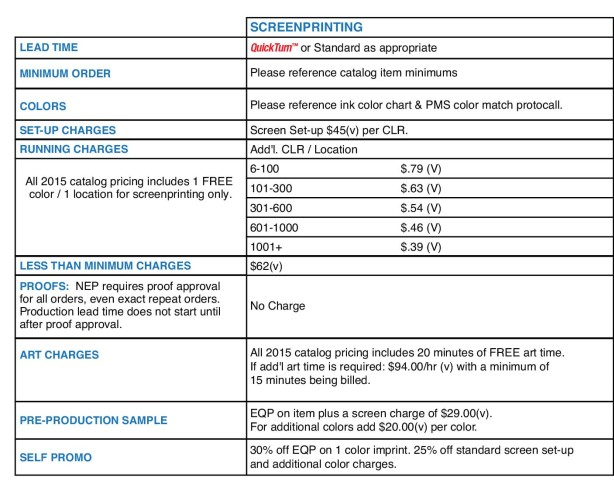 Please contact orders@neppromotions.com to confirm current lead time. Please note: All orders must be complete with approved artwork and paid deposit before being scheduled for production. Eight Days – Screenprint one color up to 5,000-10,000+ pcs. Multi-color up to 7,000+ pcs. Heat Transfer up to 10,000+ pcs. Larger quantity, multiple locations, drop shipments or special handling orders, please contact orders@neppromotions.com or customer services at 603-567-4301. If you require service quicker than the QuickTurn™ Shipping Program please contact orders@neppromotions.com. NEP Promotions can guarantee next day service with an additional rush charge. Some product exclusions apply. We require camera ready art and pompt payment for all rush orders. All samples under $10.00 EQP Net ship for FREE with a distributor supplied shipper number. (FedEx or UPS) Samples greater than $10.00 EQP Net can be purchased at 20% off EQP with a supplied distributor shipper number. Samples will ship with a random imprint unless noted in the sample request. No refunds on samples applicable. EQP on item plus a screen charge of $29.00(v). For additional colors add $20.00(v) per color. Standard production time for a pre-pro sample is 1-2 business days after art approval. All pre-pro samples will be shipped overnight unless another shipping method is noted on the P.O. If the distributor ultimately places a minimum order of the pre-production sample, we will credit the pre-production sample towards the order, which results in it being FREE.